With knowledge and learning from recent concept of social business, Proyas became motivated to launch its first social business venture for the benefit of its clients/beneficiaries on health care and diagnostic center located in Chapainawabganj town. It provides basic health care services with minimum costs. The beneficiaries of Proyas under Health Insurance Scheme, are also getting subsidized health care and diagnostic services from this center. For the economic empowerment of the community living in poverty, along with the financial assistances with micro-credit, Proyas operated its “Developing Inclusive Insurance Sector” Project (DIISP) since 2014 with support from PKSF. 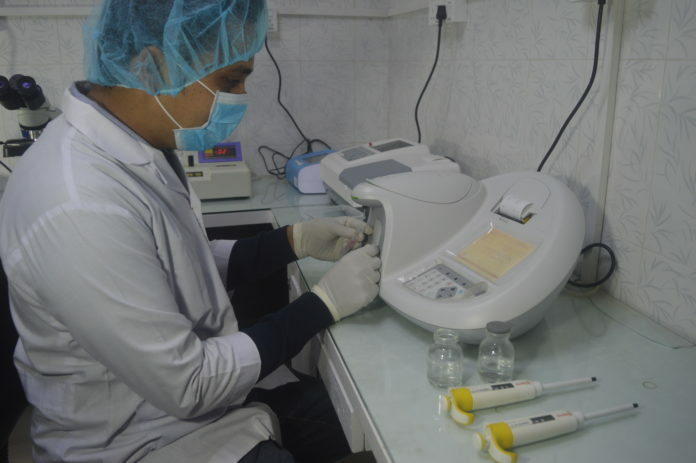 This project was funded by PKSF for one year only, but considering the benefits of the community, Proyas continued the services through its Health Care and Diagnostic Centre. This insurance service provides scope to the beneficiary households to avail credit waiver facilities along with cash grants of BDT 5,000 for performig the religious rituals if any of the loan recipients dies unfortunately. In order to popularize this very beneficial initiative, Proyas has brought its primary health care services to the door steps of the beneficiary household. One health personnel (Paramedic) is providing the primary health care services (PHC) through groups at the community level in the first half of the day and also through the static clinic in the community in later half of the day. The PHC services are also provided through the Sattelite clinics in collaboration with the government medical doctors. Since inception, a total of 22,244 were benefits with various essential health education, 13,609 individuals received free treatments and consultation, and 1,648 patients were referred to secondary and tertiary level of health facilities for better consultation, diagnosis and treatment from the static clinic and Proyas Health Care and Diagnositc Center. Moreover, a total of 2,819 patients received free treatment from the government medical doctors under satellite clinics organized by Proyas Health Care and Diagnostic Center.